Looking at a map of the southern Caucasus, you’d expect Azerbaijan to be the next big thing in the world of food, sandwiched as it is between culinary heavyweights Georgia and Iran, connected as it is in so many ways to Anatolian Turkey. Previous trips to that country have not delivered, though. The last time we were in Baku, we landed hungry and curious and left disappointed by a trip whose gustatory high point was pints and bar snacks at a pub called Camel’s Toe. But, as we recently discovered, perhaps that’s because we didn’t dig deep enough past the scummy surface of Baku to discover the lively home-style Azeri dishes like the ones served at Azerbaycan Sofrası in the Aksaray district of Istanbul. If you haven’t yet heard of Azerbaycan Sofrası, that’s because it’s a tiny cubby of a restaurant at the end of a street selling car parts, and it just opened four months ago. That’s when husband and wife Sadaqat and Telman Mehmedov arrived in Istanbul from Moscow on tourist visas. They came, saw and, a bit reluctantly, settled. “Moscow was hard, but this place is harder,” said Sadaqat. But after 17 years of working in the wholesale markets of Moscow, Telman had had enough and was ready to go back to work in the kitchen, as he had in Baku in the 1970s. Read the rest of the review at Culinary Backstreets . 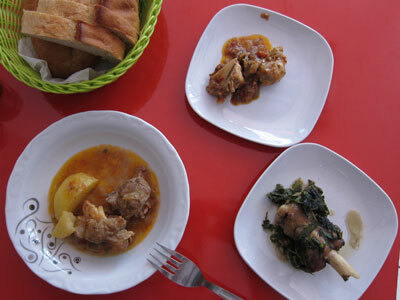 Copyright © 2009 Istanbul Eats. All rights reserved.